I was able to keep calling and I got in this wednesday since someone just cancelled! I already found a trailer to use. This one is a LOT nicer. Feeling way better about it this time around! 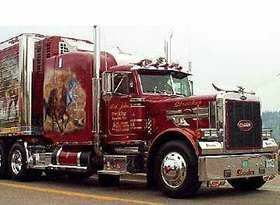 Its the insurance companies not the trucking. without the 160 hrs you will be hard to insure. most of the mega carriers are self insured. and i know a guy who did the same as you and when he hit something, the company gave another drivers information to the other company and then told that experience driver to "step up and help the company. take the hit on your record for the company cause we couldn't insure this new guy". be careful. i would imagine most companies will want at least 6 mos. the the 160 probably wont matter. As for local experience counting.... local only counts for local. Yeah that's why I am thinking I'll stay at least 4-5 months and then I will look around and start deciding whether to stay or go, based on what will be available at that point. I figure by the time it comes down to applying, I could say I have the 6 months experience and if they will accept the type of driving I'm doing as experience, I might leave this job at that point. Then again with my hourly pay, plus they pay drivers a little extra while driving, if I can manage to get enough extra hours to average 55 hours a week(which I think is a possibility), I will end up making almost 80k a year...so if I do in fact get a decent amount of OT, I may end up sticking around for a while. I guess when I said "I don't plan on staying long", it was relative to the fact that I've been working for this company for almost 15 years. Thanks for the feedback everyone. I think I'll take 2019 rust bucket. There's only a small chance they will notice the cracked shock, where they're definitely going to notice a potentially expired registration. it seems dishonest to use them and leave. and you dont have a 160 hour certificate so who will hire you? Their trailer is more rusty than that one lol. Even the brake canisters are badly rusted...but they do work and the tires are in good condition. I won't be leaving right away. In fact I may stay, it just depends on how much overtime I get out of the deal. I'll end up staying for at least 4-5 months to see how it shakes out. They'll definitely get their investment out of me, since they won't have to bring in an additional driver this season and they can use me as needed on top of my current responsibilities(I'm a production foreman)...They're going to be saving thousands in just a few months by using me as a fill in driver and not bringing on another driver full time. Another factor in whether or not I stay is what type of other jobs I'll be able to get without a 160 hour certificate, since I learned everything on my own. I know most of the big freight companies won't hire me, but surely I can find a decent local driving job here in a big city like Houston, TX. I prefer something where I can be home at least a couple nights per week anyways. If companies will be willing to consider my local driving at this job as experience, I may end up staying another year to be able to say I have a years experience. Wow...quite the rust bucket. Take a good look at the tire nearest your camera lens...looks a bit “chunked”, flat spotted. Look at the tread depth on that spot. That's not the actual trailer, just an similar one I found a photo of online. The actual trailer is a lot more rusty than the one in the photo lol. The tires are good on it, though. How are you ever going to pull a load for this company if you can't even find a trailer your confident in for the test? All this talk of rust and spliced wires is really getting overly particular. Do the lights work? Are the brakes working? Nobody cares if the tandems are rusted, or the wires are spliced. I've spliced wires on trailers lots of times - that's how I got the lights working so it would be legal. You can make this job way too hard on yourself. You don't want to start out overly stressing on non essential things. You'll stress yourself excessively and burn out in a matter of months. The lights and brakes work great. There is definitely a visible crack in the upper half of the shock, though. You're probably right and I am just stressing out about it for no reason. I really don't want to screw this up tomorrow, since they are doing me a huge favor by letting me use their truck and CDL driver on the clock. To be totally honest I don't plan on staying with this company for long after I get the CDL. All of their equipment is poorly maintained like these trailers...however it is their laid back attitude that is allowing me to get my CDL using their equipment, without making any type of commitment to drive for them. Here (NY) you don’t actually DO a pretrip, you just explain what you would do, and no one inspects the truck or trailer. In other words, you verbally do a pretrip while pointing at the parts. You don’t actually check the brake linings, or crawl under to inspect anything. Shocks? You would simply point at them. They want to know that you know HOW to do a pretrip. I'm leaning toward taking this one since I'm 110% sure the paperwork is good on it. There's a 1/3 chance I won't even have to inspect the trailer anyways. Here in TX they have you draw a card and each card represents either under the hood, the door and back of the truck, or the trailer. I'm very confused.. a shock, like a shock absorber, on a trailer? Most trailers I know of don't have shocks. They have leaf springs, or sometimes a torsion bar looking type of spring, or it's air ride..
Or are you saying that the truck you will be using has a defective shock? 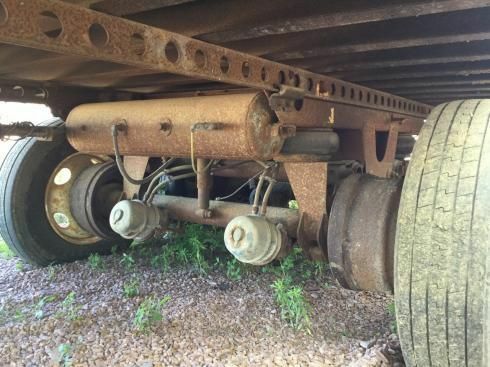 This particular trailer has a shock absorber on the center of the axle. The upper half of it has a crack. It still appears to be functional, though. You have to stick your head under the trailer to see it. How about doing a complete pretrip on a trailer with an up to date registration and just use that one. Rusty tandems? I don't know of many that aren't rusted. I did do a pre-trip on the one I found with current paperwork at the last minute today. The one I hooked up before I left looked okay, but then I noticed there is a crack on the upper part of one of the shocks, then I had to leave so they could lock up. It's on the upper part where you can barely see it. It looks cosmetic, it's not leaking and you really have to crawl under there to see it. I just know I can't honestly say "it's not cracked or damaged", because it is lol. There is also a spliced electrical wire. I know you can't have spliced hoses, but am not sure about an electrical wire with electrical tape on it. I'm afraid they might see that and then start looking more closely and then notice the small crack on the shock. It's going to be dark out when I get there tomorrow morning, so I'm concerned I won't be able to find a good 2019 trailer, and if I do, a lot of those trailers are packed in and I may not be able to get it out without moving multiple trailers. On the other hand the ones that say 2018 expiration are all super easy to get to, and I had already checked a couple of them out before I noticed the date on the registration. So I studied like crazy, made sure I had all the paperwork in line for the truck, but I wasn't able to secure an empty trailer until the last minute, since we constantly cycle through trailers. One little issue; There's about 30 empty trailers in our lot right now. The paperwork on one departments trailers says the registration expires in 04/2018. 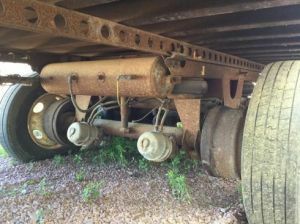 The other half are 07/2019 expiration, HOWEVER, the 2019 trailers aren't in good shape. They did pass the DOT inspection this past July, but the tandems are extremely rusted and the shocks/brake canisters look really bad. A lot of the electrical wires are also spliced. I honestly don't see how they passed inspection. According to the dock foreman, the registrations get "rolled over" to the next year, and even though it says it expires in 2018, the registration is good until 2019. He say's he is 100% sure. Does that sound accurate? That sounds strange to me. I'd rather take the 2018 trailers because they are in much better condition, but obviously if the paperwork doesn't check out it's a no-go. I have a couple hours tomorrow morning before we need to leave to the testing facility. I'm debating on unhooking the 2019 trailer in the morning and using one of the 2018 expiration trailers that are in much better shape. 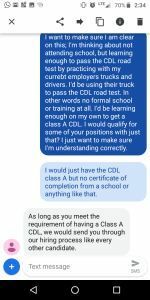 Is it possible to just jump into a truck and learn enough to get a CDL without school? The most common mistake that new drivers make while learning to back is oversteering and not waiting long enough for the trailer to react to your steering inputs. If you practice on a small trailer that reacts quickly requiring large movements of the steering wheel you're probably going to exacerbate the oversteering tendency of a new driver. Thanks Brett, I'll just double down and try to get as much time in the truck as possible in that case. It looks like I'll have the opportunity to practice back just about every day. I'm going to look up some YouTube videos on backing techniques this morning, before I go out again. BTW I really appreciate what you are doing with this site. You could definitely be charging money for your High Road program if you wanted to. As a fellow web developer and prospective truck driver, I have a lot of respect for you. Just remember that a car and trailer will react very quickly compared to a tractor and 53' trailer. There is even a very noticeable difference in reaction to the tandems being sucked all the way up and slid all the way back. I liken it to how I learned to sail a boat. You learn a lot better on the small dingy's, because any input gets immediate feedback. When you take the same concepts to a big cabin sail boat, sailing the bigger boat is a piece of cake, because the reaction time is a lot slower and you have more time to make adjustments. On that note, I was able to get the trailer lined up at the dock all by myself this time! Man this is exciting! I'll get some more details on how we log hours/miles as I talk some more and report back with that, along with my progress. I got about another hour in this morning. I hooked up a trailer, pulled it around the building and then backed it into a dock. I was able to get it pretty close, but the dock foreman ended up lining up the last bit for me, because I kept getting it just a foot or two off center. I think I'm also going to hook up my small trailer to my car and practice backing. That's the area I feel I am going to need the most work in. I'm about to head outside to hook up another trailer and back that in. Is there a certain number of miles they normally look for to consider you "experienced"? I've read some things that say there's like a 3 month, 6 month and one year mark as far as different levels of experience go, but I assume that applies to OTR driving? I'm estimating that it would take me 3-6 months to rack up 160 hours of actual time behind the wheel. Probably closer to 3. It just depends on the time of year, and we are coming into the slow season... I think if I were to stay for a whole year, I could probably log 750-1000 hours easy. Glad to hear you have another option that you feel may work for you. I'm still interested in eventually transferring to that tanker job. How would that work as far as verifiable driving experience? Do I just keep copies of all of my driving logs? One issue you still may run into is the lack of schooling/certificate if you're basically a fill in driver. Also unless the tanker job is local, many of the large OTR companies dont consider local driving to be experience. Some job postings for experience list "OTR experience", while others are only looking for "tractor trailer experience". I'm not sure how your company operates but where im at we use peoplenet for our ELOGS and it tracks mileage on a daily basis and submits that to our office for verification purposes. Being a fill in driver i think would make learning and getting in the groove a little more difficult, similiar reason many feel weekend school isnt a good option. Vincent what kind of work are you in right now? Would it be possible to have your employer cover school and transition you to a driver position? . I didn't really think about it at the time when I read it, but this was a great post! Thank you for that. I did just have a talk with our ops director and he loves the idea of me helping out as a driver. I generally put in about 40-50 hours a week currently, but he said anytime it won't interfere with my regular responsibilities, not only would he use me as a driver, but they would even pay me more money while I drive! (on top of the OT I'd already be receiving). Essentially I would be making over 40 dollars an hour while I drive the truck. Staying with this company might not be such a bad thing after all...I mean with that additional income it kind of cancels out the fact that I am having to pay a ton of money for healthcare.gov insurance. Oh and he would be letting me use the company truck to test in. Vincent what kind of work are you in right now? 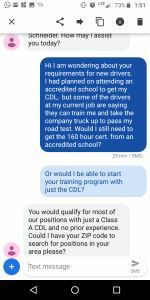 Would it be possible to have your employer cover school and transition you to a driver position? Sysco had offered me that before id left for my current company that i felt was a better match. This isnt the recommended path to take but maybe its what you're looking for. Just know if its local driving its not recommended for newbies due to long hours and close quarter maneuvering. I started my career local and feel i wouldn't have been as successful had my training not been 12 weeks (after the 4 weeks of school). With that being said, we had a driver that finished his training 2 weeks ago. Today he hit a parked car while backing. It dented their bumper in but because they invested their time and money in him they're giving him additional training rather than firing him. Who knows if they'd handle it the same had they not fronted the cost of him to obtain his license. This is an example of why many members agree paid training (with contract) is best/safest route to go. Our company is in the trade show/convention industry. They wouldn't cover school, but they would most definitely use me as a part time driver if I got my CDL on my own. I already know that if I did something like hit a parked car, they wouldn't fire me. I'm pretty confident that they would continue letting me drive, even. They definitely would not fire me over it as I play a key role within the company supervising an entire department. I also know of employee's who have been in many accidents, both in the trucks and on forklifts, and they continue to operate. You are going into this completely contrary to everything we teach, including the fact that you don't have a plan B or C to fall back on. I think it's a very foolish way to try and do something that has close to a 95% failure rate. But what do I know? Plan B is to attend the night schooling when it starts in January while working my current job. If that somehow doesn't work I have plan C, which is to forget the whole thing and continue working for the job that I didn't have to quit; While I may not like it, I would still be making a decent living if all else fails. 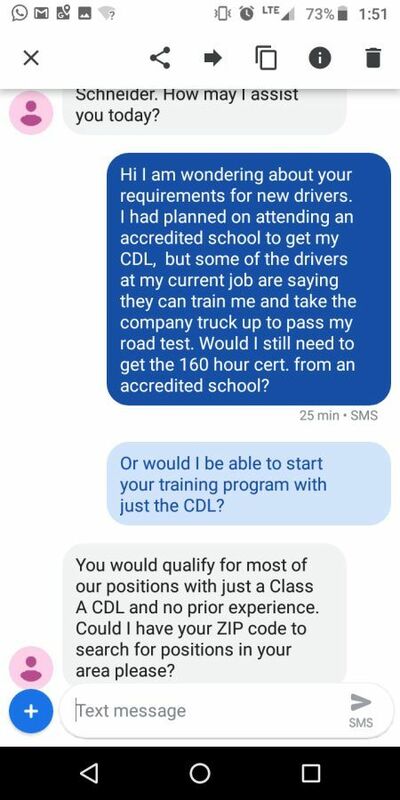 So the worst case scenario would be that I get the CDL and absolutely no one will hire me, but I might get some OT hours making runs when our other drivers run out of hours during busy times. Since I have to wait on school anyways, I don't see what trying to get it on my own could hurt. IMO the absolute most foolish thing to do at this point would be to walk out of my 60K a year stable job of 15 years and take a shot at something with a 95% failure rate, before I even have a second job secured. At least with my plan A and B, I could get an actual job lined up before quitting this one. I understand this would be a completely unorthodox way of doing things, which goes against all generalized advice...but I think I also have a very rare set of circumstances that make it a viable option for me. It can be done with your approach, but very seldom does it work out. If Schneider puts you into your own solo truck, you'd better be at the top of your game. If you screw up your chance with them, I don't know where you'll be able to turn for a job. I sincerely wish the best for you, and I hope you'll keep us posted on how things are going for ya. It seems like things going south at your first company before your first year is up would be pretty bad news regardless. I do have money in the bank, so maybe I could attend a 3-4 week program in the even that something like that happens. I'll definitely be on top of my game and I'll definitely make sure I get a ton of practice driving the trucks for my current company before making the leap. I'll keep you guys and girls posted for sure. 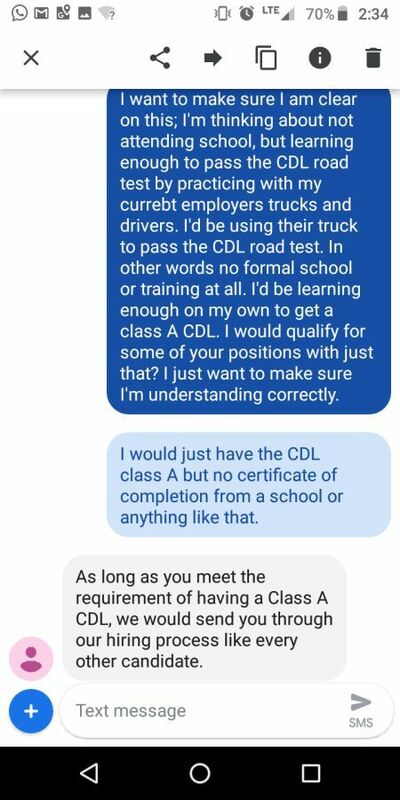 I haven't ruled out going to school yet, but my current plan is to attempt to get the CDL on my own and then attempt to get a job. I have until January to do that and if it doesn't happen by then, I'll start attending the night classes.